Pre-contact America was a vast land. Variations in climate, geography, and landscape produced a diverse collection of cultures. Many conceptions and misconceptions exist about native life at this time, and numerous aspects of this culture may forever remain mysteries. Since written records are rare, anthropologists’ studies are restricted mainly to oral histories and archeological evidence to piece together an understanding of the culture of America’s first peoples. We do know that early Americans had a rich abundance of natural resources at their disposal, and their health and welfare was heavily dependent on their ability to use those resources. Food, shelter, clothing, and tools were all commonly manufactured from simple raw materials, and constitute the main artifacts recovered by archeologists. From these artifacts, it is evident that extensive trade existed across the continent, although most groups were intimately dependent on their local resources. Consequently, many native groups were relatively transient, following large mammal herds and cycling through seasonal hunting and gathering regions as their local supplies diminished. Contrary to a long-held theory, new evidence suggests that American natives adopted a sedentary lifestyle before agriculture was developed (Schaffer, 1992). Small, fortified cities still depended on traditional methods of food acquisition, and even when corn and other plants became domesticated, hunting and gathering still constitued the main supply of food. In this environment, the ability to hunt and gather sufficient quantities of food, especially energy-rich animal proteins, was of paramount importance (Turner). Many efficient methods of food gathering were developed: these people were accomplished trappers, hunters, fishers, and harvesters. Tools required for acquiring food were manufactured from the raw materials at hand. Early explorers wrote admiringly of native cordage, which was superior to their own: fishing nets made from indigenous plant fibers were strong enough to capture, hold, and haul-in large sturgeon (Spencer & Jennings, 1965). Making nets from natural cordage is a single example of how these people created sophisticated tools from the available raw materials, but it is an important one. Nets were an ideal way to capture fish which were a common source of food and an important source of animal protein, especially in regions where the Blue Camas Lily (Camassia quamash, an important source of vegetable protein) was not common (Turner). Netting was one of the main tools used for collecting fish, and took many forms: seines, gill nets, basket nets, and other designs were used variously by many different native cultures. Weir traps, basket traps, and scooping baskets were an alternative (Figure 1), albeit sometimes requiring a greater energy input since traps and baskets were normally only effective for fish drives (chasing fish towards the traps where they could be caught). Figure 1. 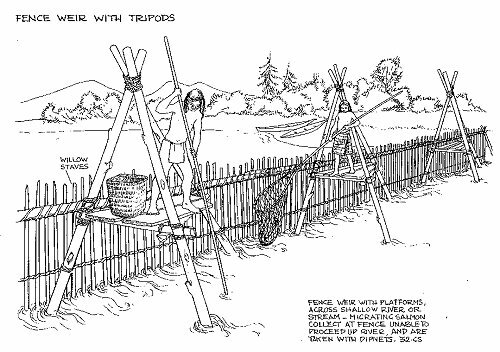 Drawing of First Nations fence weir with tripods, coastal British Columbia. However, both methods were preferred over those practiced on an individual scale, which included fishing with hook and line (angling), spearing, and shooting with bow and arrow (Spencer and Jennings et al, 1965). Nets and traps could collect large quantities of fish but required moderate preparation, maintenance, and repair. Spearing, angling, and arrowing were less efficient, but these methods required less preparation, and indeed could be performed opportunistically. One specialized form of fishing which had advantages over many other forms (under proper conditions) was the use of poisons, a practice still in use today. In northwest Guyana for example, up to 16% of the village fishers still prefer to fish with poisons despite the superiority of modern netting materials (Van Andel, 2000). The use of poisons for hunting, fishing, and warfare widespread across America, and the best known example may be the use of Curare poison (Chondodendrum tomentosum) in blowguns (Jett, 1991). Fish-poisons (also known as piscicides or ichthyotoxins) were very commonly use throughout American history (Van Andel, 2000; Béarez, 1997) and are particularly interesting because they are used for an area effect rather than against an individual target. A multitude of plant species are known to possess chemicals toxic to fish, and evidence suggests that certain plant species have different effects depending on which variety of fish are targeted (Van Andel, 2000). A general rule is that fish-poisons are only effective on relatively small fish. Two main molecular groups of fish poisons in plants, the rotenones and the saponins, as well as a third group of plants which liberate cyanide in the water, account for nearly all varieties of fish poisons (Béarez, 1997) although plants with sufficient levels of ichthyocthereol, triterpene and other ichthyotoxins are also used. The rotenones and saponins are used in small enough doses that they are harmful to fish, but not to humans who eat them. Fish killed with triterpenes need to be cleaned and gutted immediately to avoid human consumption of this toxin (Van Andel 2000). While all three categories of fish-poisons are found in a diversity of plants, and although their effect on different species varies, they are each used in a similar manner. The active ingredient is released by mashing the appropriate plant parts, which are then introduced to the water environment (Figure 2). Figure 2. 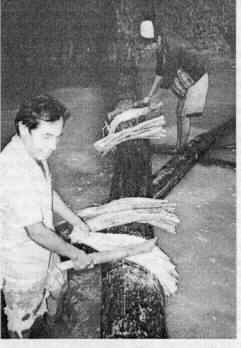 Fishers in Guyana pound the roots of Lonchocarpus, releasing the ichthyotoxins into a stream. Poisoning was generally done in stagnant pools or slow-flowing streams and rivers, but has also been used by Californian Indians in saltwater environments for octopus and low-tide shellfish fishing (Heizer, 1953), as well as for catching fish trapped in inter-tidal pools (Béarez, 1998). Poisoning was such an effective method of harvesting fish that it was not uncommon for groups in some areas to purposefully dam small streams and ponds for this express purpose. Reducing water flow ensured that small quantities of the poison worked at maximum efficiency by minimizing dilution. In cases where the poison was not entirely effective, such as a restricted supply of poison or where stream flow diluted the strength of the poison, fishermen with scooping baskets, spears, or bow and arrows aided in capturing fish that were not fully drugged. A different method used by the Carib Indians who live along the Barama River in Guyana involves the preparation of kunami balls. Pounded Clibadium leaves are mixed with fresh Cassava (Manihot esculenta) roots, rolled and baked; ashes of burnt Cecropia leaves are added to the resulting paste and pounded further; the mass is kneaded into small balls, rolled in flour, and thrown in the river where fish swallow the balls whole. The effect of this method is similar to other fishing poisons in that the fish become stupefied and float to the surface. The most common use of fishing poisons documented are plants containing saponin, a glucoside poison. This chemical is usually active in the stem or wood and is diversely distributed among several plant families (Amaryllidaceae, Convolvulaceae, Dioscoreaceae, Lamiaceae, Lecythidaceae, Liliaceae, Papilionaceae, Sapindaceae, Scrophulariaceae, Solanaceae, Verbenaceae, and others).Plants containing saponin are also commonly used as soap substitutes because they can often be worked into a lather. Likely, saponin plants were primarily used for washing or cleaning and secondarily used as a poison after their effect on fish in washing-streams was discovered. Saponin normally breaks down in the digestive system and must enter the bloodstream to be toxic (Elpel, 2000), but fish assimilate saponin directly into their bloodstream via their gills. Fish poisoned by saponin become stupefied and float to the surface where they can easily be collected. Cultural traditions and archaeological research suggest that a large number of indigenous tribes across the Americas used saponin poisons from many different plants to harvest fish. The Catawba, Cherokee, and Delaware made a fishing poison from the ground bark of Black Walnut trees, Juglans nigra. The Yuchi and Creek used the roots of the Devil’s Shoestring, Symphoricarpos orbiculatus, and the fruit, twigs and buds of the Horse Chestnut, Aesculus hippocastanum L., to make two similar fish poisons. The Rappahannock made a fishing poison by mixing cornmeal with fish brine and allowing it to stand overnight before use. Cherokee tribes used the berries of Polk Sallet, Phytolacca Americana, to produce saponins for fishing. The Costanoan Indians of the California area used the pounded leaves of Turkey-Mullein, Eremocarpus setigerus, and the fruits of California Buckeye, Aesculus californica (Bocek, 1984), as well as the entire crushed Soap Plant, Chlorogalum pomeridianum; Indian Hemp, Apocynum cannabinum; Pokeweed, Phytolacca americana; and Indian Turnip, Arisaema triphyllum (Goodchild, 1999). The pulp of Lechuguilla leaves (Agave lechuguilla) are used by Mexican Indians (Alloway, 2000). Further south, in Venezuala, indigenous cultures used the fruiting branches of Soapberry, Sapindus drummondii, and the fruits of Mexican Buckeye, Ungnadia speciosa in the manufacture of their fish-stunning poisons. Not far from there, the Engoroy of Ecuador used and continue to use theThophrastaceae endemic, Jacquinia sprucei, a shrub whose globulous fruits contain high levels of saponin. In addition to the above, Angier (1972), lists the seeds of Southern Buckeye (Aesculus pavia) and the crushed leaves and stems of Fish Weed (Croton setigerus)as fish-stupefying poisons. The second group of fish poisons, the rotenones (a flavonoid), are found almost exclusively among legumes (Papilionaceae, Mimosaceae, Cesalpiniaceae), and more specifically in the family Fabaceae. Rotenone was first isolated in 1929 in the roots of its Peruvian namesake, the plant Rotenone (Lonchocarpus sp., locally known as barbasco or cube). Two species of this genus, L. utilis and L. urucu, quickly became an export product as an insecticide due to their relatively high (5-12%) rotenone content. Two related species from Guyana, L. martynii and L. chrysophyllus contain only 2.4% rotenone and are not considered commercially competitive (Van Andel, 2000). Another rotenone (L. nicou) is employed against piranha, and will kill them and their eggs in only 15 minutes at a concentration of 3ppm (3mg/kg) (Duke, internet). When rotenone is introduced to the water by crushing or mashing the appropriate plant parts (usually the roots) fish respiration is damaged and they are forced to gulp air at the water surface where they are vulnerable. The liana, Derris eliptica, has been used so successfully as a piscicide in India that it has been widely introduced to other parts of the world where it has become an invasive species (Pacific Island Ecosystems at Risk, 2000). In the western world Devil’s Shoestring, Tephrosia virginia, is a legume that was used by the Catawba people to treat rheumatism (Speck, 1937). It has been speculated that this perennial herb may also contain sufficient quantities of rotenone to function as an effective fish poison, but it has not knowingly been tried. Northern Guyanan natives effectively use two plants containing triterpene, Euphorbia cotinifolia L. and Phyllanthus brasiliensis (Aubl.) Poir., to poison fish. A large basketful of the leaves and stem of these plants will poison small fish in a stream (Van Andel, 2000). E. cotinifolia may be the most toxic of all fish-poisons; this plant’s latex causes blistering if it contacts human skin, and blindness if it comes in contact with the eyes. Fish killed using triterpene must be immediately gutted and cleaned to prevent human consumption of this toxin. There are many additional plant species with ichthyotoxic properties that are less frequently used, and subsequently less studied in the literature. Some other fish-poison plants in Guyana that have been mentioned (Fanshawe 1948, 1953; Killip and Smith 1935) include Mora excelsa Benth., Bauhinia spp.,Alexa imperatricis (R. Shomb.) Baill., Clathrotropis brachypetala,Gustavia augusta, Macrolobium acaciifolium, Paullinia pinnata,Pentaclethra macroloba, and Ryania pyrifera. A horde of other plants reputedly work as fish poisons, but reference to their use is difficult to uncover in the scientific literature. Popular literature, anecdotal evidence, and information gleaned from modern survivalists and seekers of historical plant knowledge contain vast amounts of information. Some fish-poison uses that were found in the public literature but did not show up in a scientific literature search include ground Black Walnut hulls (J. nigra), pulped flesh of Wild Cucumber fruits (Marah spp., Family Cucurbitaceae), and the whole Wooly Blue Curl plant (Trichostema lanatum). The leaves and berries of Common English Ivy, Hedera helix, reputedly contain a glycoside called hederagenin that may also stupefy fish. Fish-poison plants have provided and continue to provide food for ancient, primitive, and modern Americans. Although the process of documenting the many fish-poisons and their use is ongoing, interest in these plants’ potential uses in medicine, agriculture, and industry is growing. Some fish-poisons are reputed to ease or erase the symptoms of HIV and AIDS, although their effectiveness has yet to be clinically proven for the most part. Other uses also exist, but may not elicit as much attention as reputed remedies for such important diseases as AIDS and cancer. Ethnobotanical research of Guyanan fish-poisons has shown their multicontextual use, from remedies to aphrodisiacs. Many fish-poisons are grown to manufacture insecticides, but the exploitation of these plants for other applications is possible. A review of the available scientific and popular literature reveals that the ancient practice of poisoning fish was an important method of securing food, and continues to flourish in many cultures today. A modern medical perspective on these plants may uncover additional uses for these plants. Unfortunately, the poisoning of streams to capture fish has had ecological consequences. The efficiency of this method has ensured that its increasing use as populations increase may result in the extirpation of susceptible fish species from their native streams. Despite illegalization of this method in countries such as Guyana, the practice continues and many of the plants are grown commercially, both for personal use, for sale to one’s neighbours, and for production of industrial products. It is with caution, then, that we should explore these uses, both from a standpoint of caution when using plants to poison fishes, but also (and perhaps more importantly), from the standpoint of exercising caution when infiltrating these cultures for industrial, pharmaceutical, or technical purposes. Alloway, David. 2000. Desert Survival Skills. University of Texas Press, Austin, Texas. Angier, Bradford. 1972. Survival With Style. Stackpole Books, Harrisburg, Philadelphia. Bocek, Barbara R. 1984. Ethnobotany of Costanoan Indians, California, Based on Collections by John P. Harrington. Economic Botany. 38(2) 240-255. Elpel, Thomas J. 2000. Botany in a Day: Thomas J Elpel’s Field Guide to Plant Families, 4th ed. HOPs Press, Pony, Montana, USA. Fanshawe, D. B. 1948. Forest products of British Guiana, part II. Minor Forest Products. Forestry Bulletin No. 2. Forestry Department, Georgetown, USA. Goodchild, Peter. 1999. Survial Skills of the North American Indians. Chicago Review Press, Chicago, Illinois. Heizer, R.F.. 1953. Aboriginal Fish Poisons. Anthropological Papers. 38 225-283. Killip, E. P., and A.C. Smith. 1935. Some American plants used as fish poisons. U.S. Department of Agriculture, New York Botanical Garden, New York, USA. Shaffer, Lynda Norene. 1992. 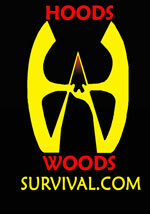 Native Americans Before 1492 The Moundbuilding Centers of the Eastern Woodlands. M.E. Sharpe, Armonk, New York, USA. Speck, Frank G.. 1937. Catawba Medical and Curative Practices Benjamin press. Turner, Nancy. “Food Plants of Coastal First Peoples”. Royal British Columbia Museum Handbook, UBC Press, Vancouver, Canada. “Food Plants of British Columbia Indians Part II – Interior Peoples”. British Columbia Provincial Museum. Handbook No. 36, Canada.